`@Nartanasala` is a Poor Comedy!. Radha Krishna (Naga Shourya) is all for women empowerment and runs an organization to train them in self-defense. He solves Manasa`s (Kashmira) problems and eventually falls for her. But His dad (Sivaji Raja) arranges marriage with Satya (Yamini), Daughter of a (Rayala Seema) Faction family. To escape from this tricky situation, Radha Krishna reveals that he is gay, to Satya’s family. How he manages his gay act and succeeds in love forms the Rest. 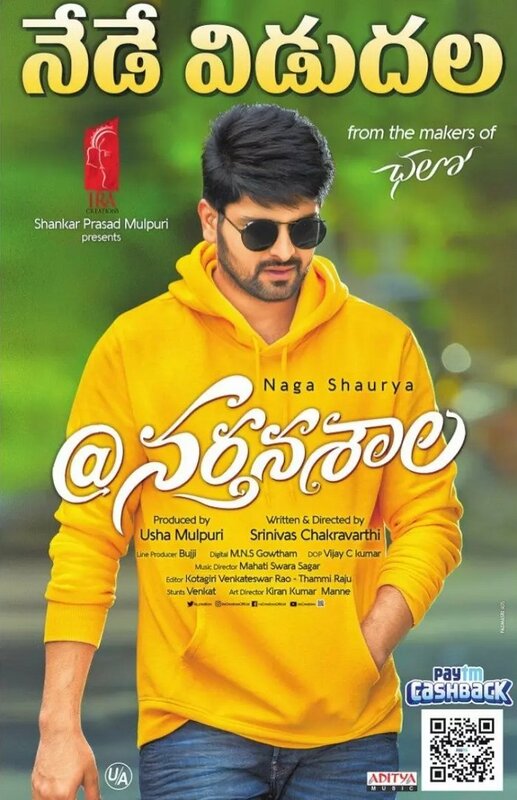 Naga Shaurya is decent and surprises with his Gay act. Jayaprakash Reddy stands out with his comedy timing. Kashmira and Yamini are ordinary. Ajay, Sivaji Raja and others are adequate. Music: Songs are ordinary. Background score is decent. `@Nartanasala` has a wafer thin story line with an entertaining conflict point. But the director has let the film down with his poor narration especially in the 1st half. Although the 2nd half of the film gets some what better, saved by JP, the damage is already done and the audience feel disconnected. The film might probably suit as some time pass affair, if you can survive the 1st hour. Boxoffice Verdict : With Worldwide Theatrical Value at around 9 Cr approx this will find the going tough.